Because some nights you need dinner fast. On any night you need dinner fast. That's why this recipe is going to feel something of a miracle. It cooks in one pot and tastes like you worked all day on it. Chop, slice, dunk, boil, simmer, season and you’re ready to go. Little forethought (I mean, isn’t there always an onion in your pantry and a couple of tomatoes around?) and it makes a complete meal. The kind of dream dish that you make once and you’ll make twice, thrice in a row...and then you’ll be making this over and over again. You can add on stuff to customize it if you like. One night, I added shredded chicken. Another night, I had it with a fried egg on top. Endless combinations to suit your preferences. It may look like there’s a ton of onion in it, but trust me it will disappear by the time the quinoa is done cooking. And play with your spices to adjust to your liking. This is great per se with all the "fresh" flavors - garlic, basil, olive oil, tomato and a little heat; but can definitely made better. You’ll taste all of the great fresh ingredients and still picked up on the spiciness of the red pepper flakes. If you’re like me, you’ll barely be into your second bite before plotting to make it again tomorrow. 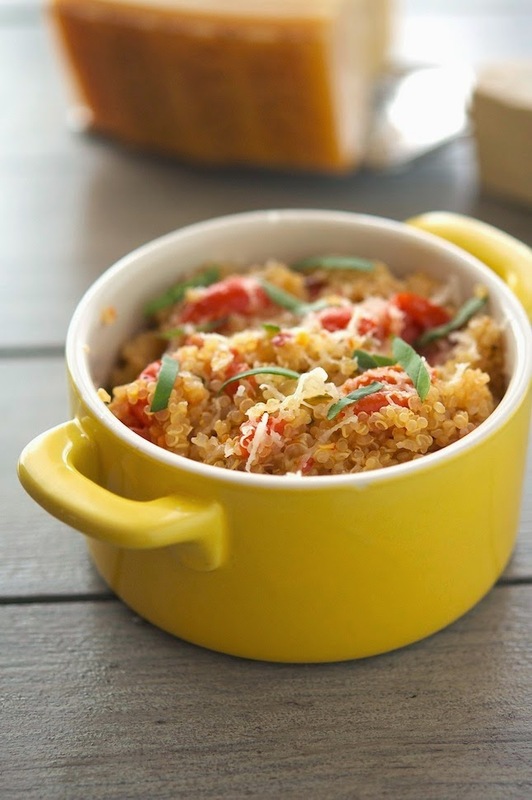 One-Pan Mediterranean Quinoa Print this recipe! Add each ingredient to a pot as you finish preparing it. Bring uncovered pot (no lid necessary) up to a boil, reduce to a gentle simmer (turn heat down to the lowest setting), cover and cook for 15 minutes. After 5 minutes, remove the lid, and gently fluff with a fork. The quinoa should be perfectly cooked and the cooking water should be completely absorbed (you should see tiny spirals (the germ) separating from and curling around the quinoa seeds). If not, though I’ve never found it necessary, cook it for additional 5 minutes until all the water has been absorbed. Sprinkle with basil ribbons, grated Parmesan cheese (if using), drizzle with olive oil and eat immediately. One serving yields 426 calories, 12 grams of fat, 68 grams of carbs and 13 grams of protein. OMG Mike, this looks insane! This looks awesome, and any leftovers would be perfect for a packed lunch the next day! Absolutely, this is like the perfect leftovers lunch! 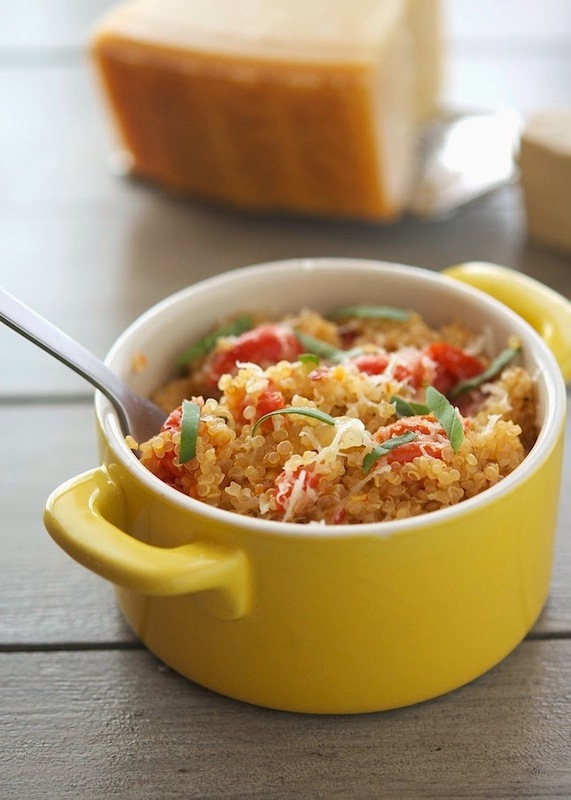 Oooh - basil and Parmesan with quinoa - in a quick, one pan dinner? Brilliant Mike! 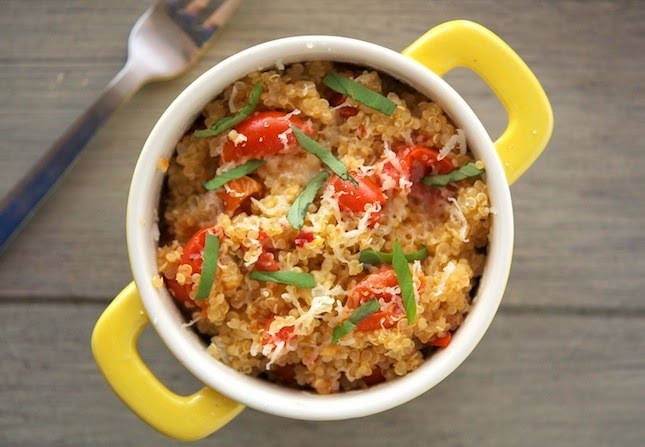 I always have cooked quinoa in my fridge and throw in some veggies and eggs for a quick dinner, but never have added parm and basil - I am thinking this needs to happen tonight! Thanks my friend for this recipe - your pictures are amazing! Thank you so much Shashi, yo're always the sweetest! Some nights?? EVERY NIGHT I NEED DINNER FAST - My inner HANGRY is one psychotic BIZNITCH! ah ha ha ha ha! ;) And I love one pot meals, clean up - A BREEZE! Sadly... The recipe I am cooking today for next week, definitely includes far more than ONE pan! UGH!!! #Whereismymaid? OH THAT'S RIGHT - I don't have one! LOL! You plan dinner around at breakfast? You're one awesome mum/wife Lauren. I wish I was that organized! I'm a fan of anything done in one pot and in 20 minutes. And adding that fried egg on top sounds awesome. Oh heck yes. Anything with fried egg is better, innit dude? Love this dish Mike, one pot, great ingredients and 20 minutes, done. perfect! 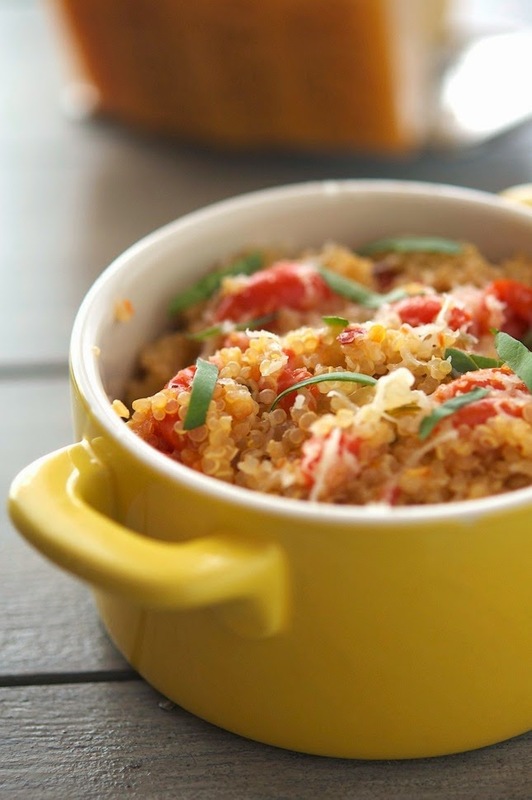 I love quinoa and this looks great! Gave your recipe a try today and loved it! :) Its the perfect one pot dish! We've made this twice now... it is delicious and an easy work night recipe! Thanks! I'm having friends for dinner on Sunday (making your Chipotle Honey-Glazed Chicken with Avocado Cream Sauce... again) and I think this will be my side dish! Only, I think I'm gonna double the recipe to make sure I have leftovers for that fried egg... and I'm gonna try it with some crumbled feta I already have. Can't wait! This was really good! Makes a ton of food, too.